Today’s cloud market is ripe with offerings from the large well known public cloud companies as well as niche players. That doesn’t mean that it’s working for channel partners. Or even their end customers for that matter. One cloud provider is trying to set themselves apart from the pack by offering something that not only performs better, it helps channel partners grow their business. Yes you guessed it, that provider is us: OrionVM. The main advantage of OrionVM comes from its technical distinctions from the hyper-scalers, especially to clients that have end solutions which require the utmost quality. As our client and partner CloudCo Partner, 888VoIP recently shared with CRN magazine the advantages of working with OrionVM offer their company the ability to offer clear voice solutions that they couldn’t find by working with any other IaaS provider. Besides the technical advantages, partners also find the support they get by working with OrionVM to be a huge incentive to working with a niche provider versus the larger public cloud companies. The OrionVM marketing team recently sat down with OrionVM Co-Founder and CEO Sheng Yeo to learn more about what sets OrionVM apart from the crowd. Q: The hyperscale public cloud providers are well established and constantly adding new features all the time. They are increasingly competitive. So how do competitors stand a chance? SY: OrionVM’s key differentiation fundamentally stems from tech innovation – our “secret sauce” is how we have uniquely architected and built our cloud stack. This cloud architecture, modeled on Supercomputers/InfiniBand, delivers markedly better performance/resilience at significantly reduced price-points. This tech innovation is then “bottled up” and made easily-leveragable in a white-label wholesale cloud platform that channel partners can brand and deploy it as their own. OrionVM is in effect trying to create a new B2B category of next-gen wholesale IaaS as the “building blocks” that enable channel partners to deploy technically advanced, enterprise-grade cloud solutions that deliver high margins, control and flexibility. This category, in turn, provides IT resellers with a competitive advantage that they cannot achieve when using the incumbent public clouds vendors. Big players in this market are great at adding features to their offerings, but they come with complexity, vendor lock-in, and minimal margins. We compete by providing our channel partners with a solid, fast, easy to use foundation they can build on themselves. Our key differentiator is how we enable our customers to brand and launch their own cloud products and solutions, focusing on helping them transition to becoming cloud service providers (CSPs). To support this, we have built a technology stack that allows us to differentiate on the infrastructure providing the performance and margins required to run a wholesale cloud business. We’ve also cultivated an ecosystem of channel partners each supporting various solutions such as VoIP, data analytics, enterprise application hosting, document management, even animation rendering. Q: What is your strategy for gaining share of the public cloud market? SY: Our strategy is to gain market share via our channel. We are a channel focused company that believes heavily in supporting our channel partners in their journey from legacy solutions (in their role as an MSP, Integrator or Telco) to becoming a cloud service provider (CSP). Each of our partners is a leader in their vertical or region allowing us to achieve joint success with each partner by taking a foundational approach when powering their solutions. This strategy has seen great traction in 2017 and 2018 and we see a very busy 2019 ahead of us as the market pushes towards adoption of wholesale cloud strategies as a way to complement existing strategies. Q: How do you lure channel partners to use you rather than one of the big hyperscalers? SY: We don’t see ourselves as luring as much as letting the technology platform and business model speak for themselves. Unlike the large incumbents we don’t compete with our channel, and we actively develop working relationships. We focus every heavily on providing support to partners to build and launch their own cloud solutions. It is these mutually beneficial partnerships that results in channel partners choosing OrionVM rather than the bigger hyperscalers. In addition to this, we are also a wholesale platform that allows us to provide margin to the channel rather than becoming a “me-too” public cloud reseller. Q: What can partners get from you that they can’t get from the big end of town? SY: OrionVM provides the core building-blocks required by our partners to brand and launch their own cloud platform. Our focus is on our core competency, namely delivering ultra-efficient, high performance, cost effective cloud infrastructure. We provide a unique combination of technical and business features, including providing a multi-level white labelling to support existing channel strategies. Q: What do your customers tell you about why they chose you over a public cloud? SY: Along with the higher margins and high-performance tech, 2018 represented a palpable turning point in attitudes to pricing. Partners have switched to us after being frustrated with hidden costs, opaque or non-existent communication, and the vast expense for simple features like interconnects. Our up-front, simple price structure and affordable features make it easier for MSPs, Telcos, and systems integrators to build their stacks and quote their clients. We’ve also focused heavily on enabling our partners to build hybrid products, such as bundling their existing network (in the case of a Telco) with our cloud solution. We also provide a lot of support when it comes to productising their solutions and go-to-market strategy. Q: Which vendors power your offering? SY: We use a combination of best of breed open source with our own secret sauce for orchestration and distributed storage. On the datacentre side, we work with Tier 3 data centre providers Equinix, AT&T and CoreSite for physical space, cooling and power. In terms of hardware and networking, we leverage servers from SuperMicro and Quanta. On the networking front we utilize Mellanox Technologies, Cumulus Networks Linux and Broadcom for our Ethernet and InfiniBand hardware. We also partner with many software and appliance vendors such as WatchGuard, Microsoft and Suse. When you take all of this background color into consideration it becomes clear that OrionVM is in a different category – our wholesale cloud offering is truly a stand out from the other options available to channel partners today. One thing OrionVM can’t call ourselves is a follower. We do not follow the big names. We are carving our own path by focusing on what the customer needs, and how to deliver a better solution for the market. We are different and there is a need in the market for an IaaS provider who can also work with other technologies and puts the customer first. This customer centric approach creates a winning environment for cloud vendor, channel partner and the customer. Everyone wins. Famed Q&A site Stack Overflow have run their annual developer survey again, asking the industry about the technology they use, their job prospects, and other trends in the industry. Feedback from past years lead to a briefer survey that was easier to complete, but it still covered a broad range of topics. The answers have yet to be aggregated and published, but we find these surveys fascinating for the substance of *what* they ask as much as how people responded. Most of the questions are formed as multiple choice, which provide hints as to what had mind-share over the last twelve months. From a wholesale cloud perspective, there were a few intriguing questions about platforms and use of specific technologies. The public cloud incumbents got mentions alongside projects such as the Raspberry Pi, with other KVM-based clouds featured in past years falling by the wayside. The industry is not as done-and-dusted as perhaps people think. The increased use of containers also garnered a question, with Docker and Open Container Initiative receiving mentions, though interestingly not rkt or FreeBSD Jails. And the miscellaneous tech section still showed a keen interest in automation systems such as Ansible and Puppet; both of which we’ve continued to see increased interest in at OrionVM. In this episode of the EmTech Cast, OrionVM CEO & Co-Founder Sheng Yeo talks with CompTIA communities leader Jim Hamilton about innovation inside commoditization. “We’ve built tech that allows us to sidestep a lot of the scaling problems,” Sheng Yeo said. OrionVM is thrilled to be supporting Nebula Studios’ latest project currently in production, Don’t Feed These Animals. The short animated film is being developed with the support of MAXON Cinema 4D, NVIDIA, Redshift, Wacom, GridMarkets, and OrionVM. 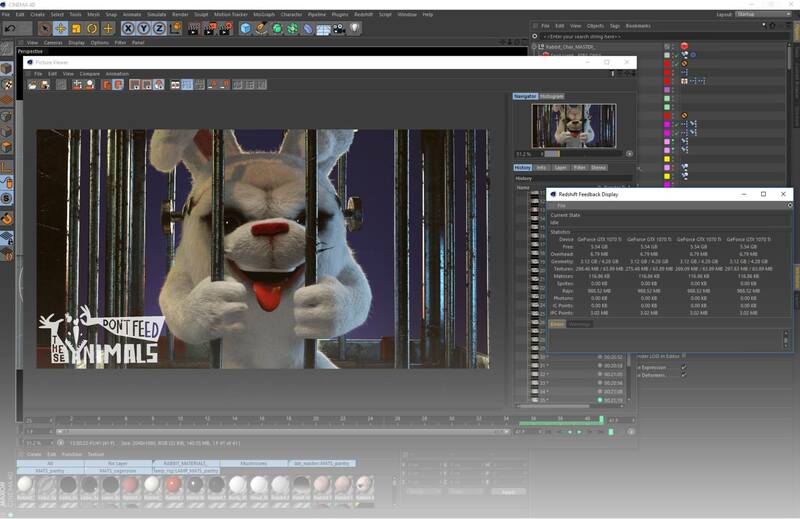 The film’s debut is expected for later this year, and in the meantime you can follow the team’s progress on their Facebook page as they share exclusive behind–the–scenes production diaries; these detail the cutting–edge techniques employed that cinema 4D and the many other sponsors made possible. OrionVM is hosting the project in our top tier data centers, allowing for unprecedented delivery speeds and reliability. The talented suite of collaborators includes technology partner GridMarkets who facilitate the rapid project rendering. OrionVM and GridMarkets have been working together for the past few years to underpin and bolster the animation and rendering vertical that has helped the production of various animations for leading studios, and artists like Deadmau5. Nebula released an animated holiday short back in December. Stay tuned for the final release. Hi, it’s Ruben here reporting on AsiaBSDCon 2018. As I mentioned in my previous post, this was our first time participating. The event is held each year at the Tokyo University of Science, and showcases the latest developments in the BSD community, including FreeBSD and NetBSD – the BSD flavors that OrionVM supports as templates for partners to deploy. This year was a big one for virtualisation and automation. Day one featured Benedict Reuschling of the FreeBSD Foundation giving talks on Ansible and ZFS, with some great hallway discussions on the challenges people are facing with large storage arrays and using Ansible with the FreeBSD ports system. It was great to meet some of the people behind these technologies our partners and I deploy and use every day. Bhyvecon took place on day two, with presentations and open discussions on the latest developments in BSD virtualisation, including Xen, bhyve, and vmm. It was particularly heartening to see the amazing work students from Bucharest have done with bhyve VM suspend and resume. And most importantly, Groff the BSD goat made an appearance. Days three and four were deep dives into BSD research and development; with talks ranging from building security appliances with FreeBSD and institutionalising virtual FreeBSD hosts, to kernel profiling and Linux rumpkernels on BSD. Henning Brauer’s presentation on x-ray machine networks using OpenBSD must have won the prize for most entertaining and original, right down to the required white gloves! In the hallways, we saw Japan’s NetBSD teams running their OS everywhere, including seemingly each Raspberry Pi generation. This anime fan noted the re-appearance of Mikutter, and the best desktop backgrounds and mascots in attendance. It was a fantastic, intimate event with bento lunches, Japanese beer, embarrassing photos with my BSD heroes and the best and brightest minds in the community gathered to talk about the world’s greatest operating system family, in this humble writer’s opinion. Thanks go out to Hiroki Sato and the Programme Committee Members for all their hard work putting together this conference; to Michael Dexter for coordinating bhyvecon and to the OrionVM team for giving me the opportunity to attend and contribute. Here’s to a great year for BSD on OrionVM Wholesale Cloud. OrionVM is going to AsiaBSDCon! For the first time, OrionVM will be represented at AsiaBSDCon, the preeminent event for BSD operating system developers, engineers, and end users. As one of OrionVM’s solutions engineers that helps partners migrate and build their cloud environments on OrionVM, I’m genuinely excited to report I’ll be attending AsiaBSDCon in Tokyo, Japan this month! I will be attending the talks and whitepaper sessions, including bhyvecon. OrionVM is a proud early adopter of FreeBSD in the cloud, and has seen its use expand since providing it as a first-class template on the platform. Web servers, databases, and file servers built upon the system’s robust ZFS implementation run production workloads for government, business, and non-profits. My history with the BSDs stretches to early high school, when I dual-booted Mac OS X – itself based on BSD – with a copy of NetBSD/macppc port on an iBook G3. FreeBSD came around from home brew desktop experimentation; the tireless FreeBSD KDE project maintainers had built the most feature complete BSD desktop around. Today, most of my family has been set up either with Macs, or PC-BSD, and my personal projects run on rock-solid FreeBSD and NetBSD servers. Today, I’ve advocated for FreeBSD internally within OrionVM, and helped build it as a first-class template that can be deployed along with the usual Linux and Windows Server suspects. Partners use the template for web servers and databases, but we’ve seen an uptick in interest in the last couple of years for its robust, kick-arse GELI/ZFS combination for secure file servers. This year, the engineers and I also hope to have our NetBSD template available for deployment. NetBSD’s pedigree with the Xen hypervisor stretches back to 2004 with Christian Limpach’s port; the first among the BSDs. NetBSD’s clean design, speed, and portability has won it fans running it on everything from toasters and embedded systems, to enterprise server clusters. AsiaBSDCon will be held March 8th to the 11th at the Tokyo University of Science, Japan. Online registrations are still open for those interested in attending. I hope to see you there, daemons and all! http://www.orionvm.com/wp-content/uploads/2015/02/orion_logo_v31.png 0 0 Ruben Schade http://www.orionvm.com/wp-content/uploads/2015/02/orion_logo_v31.png Ruben Schade2018-03-09 08:36:052018-04-05 09:07:44OrionVM is going to AsiaBSDCon!